Contrary to popular belief, optimism and ‘positive thinking’ are not the surest paths to happiness and success. To be truly fulfilled, we need to embrace the power of pessimism. That is the rather surprising claim made by philosopher and poet, Alan Murray, in this hugely entertaining collection of quips, quotes, poems, and prose. Drawing on fascinating recent research in the fields of medicine and psychology, Murray’s Introduction shows how a certain kind of pessimism is not only better for our physical and mental health, but might also improve our professional and material prospects. Mocking the pretensions and pseudo-scientific claims of self-appointed lifestyle gurus, Murray’s book offers a more honest and effective approach to life’s perennial problems, while also providing inspiration through the thoughts and sayings of writers, thinkers, and comedians from ancient times to the present day. Readers will certainly find some familiar names here, but Murray’s impressive erudition ensures that there are plenty of fresh discoveries, too, with something new and unfamiliar on every page. But this is no mere random collection of quotes. What makes it especially enjoyable is that the quotations are often juxtaposed in clever and unexpected ways so that authors represented here appear to be engaged in a brilliant dialogue across continents and centuries. It is a book that will appeal not only to those already inclined towards pessimism, but to anyone who is tired of the irritating, relentlessly upbeat vacuities of contemporary life and who is seeking something deeper and more rewarding. “Pessimism is so much funnier than optimism and this book must have succeeded in gathering together every smart, witty, rueful and ironic thought about the subject. Preceded with a thoughtful essay on the subject, these quips and insights surely say everything there is to say about pessimism. “The book is divided into two parts. The first is a very thought-provoking essay on pessimism and related topics. The second is a wonderful collection of observations on this topic by some great minds, including several pieces of brilliant poetry by the author. Highly recommended” – John Slaby on Amazon.com. “Thought-provoking introduction, well argued & entertaining. A book worth dipping into again & again!” – Anonymous on Amazon.com. “If it has ever struck you that the journey through life seems to be either an uphill grind, flat or on the downward slope then this is the book for you. If you have ever looked at the glass and thought that whether it is half full or half empty doesn’t really matter as it is sure to contain something thoroughly noxious, then this book will reassure you that your fears are justified. Others have drunk from that glass and felt quite ill afterwards. 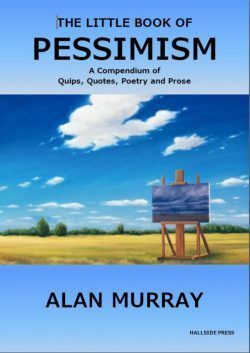 The book begins with an introduction by Alan Murray that makes a valuable distinction between pessimism as a response to life’s vicissitudes and depression as a psychological state. It goes on to make a good case for the benefits of pessimism and the downside of optimism, thereby implying the distinction between pessimism and despair. After the introduction, we are given a wide range of engaging quotations from writers of many different kinds reflecting a realistic/pessimistic view of human life. These are interspersed with occasional ones reflecting the limitations of the pessimistic outlook. An example would be Randall Jarrell commenting that ‘The people who live in a golden age usually go around complaining about how yellow everything looks.’ Of course one could interpret this as meaning that people can’t even be trusted to get their pessimism right. Finally, the cover image of this book is very well chosen. If you are reading this review you have probably seen it. It shows a landscape painted as more gloomy than it actually is. We see a contrast between a pleasant reality and a dark rendering of it in an image but we are shown this by means of something that is itself an image. Shades of Magritte and his pipe. Alan Murray’s background is in philosophy and I suspect this is reflected in this clever choice of cover” Anonymous on Amazon.co.uk. “The author gives a balanced view of optimism and pessimism, referencing psychological and sociological studies, with some surprising and informative facts that challenged my preconceptions of these concepts. He then gives a ‘health warning’ to dip into the book at intervals rather than read it in one go-I ignored that and read it pretty much straight through and found it readable and enjoyable as Murray weaves ‘a narrative of pessimism’ using an array of poems, quotes and prose both humorous and some more serious, from writers, politicians, philosophers,psychologists, characters from film, and fiction-Marvin the paranoid android and Charlie Brown being two of my favourites; as the glass half-empty/half full debate is particularly amusing” Anonymous on Amazon.co.uk. “In his introduction, the author outlines a case for seeing pessimism in a positive light. This puts a different slant on our beliefs, making us realise, it’s not the demon most people believe it to be. I’m reassured that my pessimistic outlook has certain merits after all! It is sure to challenge optimists views. The quotes are thought-provoking as well as witty and amusing. The following is a good example: “Always borrow money from a pessimist, he doesn’t expect to be paid back”” – Anonymous on Amazon.co.uk. “This books starts with some hilarious quotes and soon gets into its subject matter in a deeper and interesting exploration. I downloaded the Kindle version on my phone as light accompaniment on the tube and realise I’ll have to be careful not to miss my stop, it’s so absorbing. Still, it will be finished soon as this rate” – Anonymous on Amazon.co.uk. “Murray is a great writer and has managed to capture every essence of these subjects in an insightful and comforting way. This will be a bittersweet read as a lot of it is so relatable. I’ve needed this book! !” – Rebecca Way on Amazon.co.uk.